Bill O’Reilly never seems to want for topics to Hulk out over; the man easily flies into a rage when presented with facts or evidence contrary to his “facts”. So it wasn’t surprising to see the ever-apoplectic pundit work himself into a bit of a lather on Fox & Friends recently. But his latest tirade ended with him calling out celebrities for taking an interest in the democratic process and, later, challenging Will Ferrell to a debate. On Tuesday, O’Reilly complained to his Fox colleagues about all of the celebrity endorsements of Bernie Sanders. He lit into Ferrell for some reason, trashing the actor for backing a candidate O’Reilly assumed he knows nothing about. It seems O’Reilly was still smarting over some remark Ferrell made (the sourpuss thing, maybe? ), but he was also angry with celebrities for engaging in politics as if they’re part of the citizenry and not feudal lords or something. Things escalated quickly, with O’Reilly calling Ferrell a “pinhead” and challenging him to a debate about Sanders, politics, and even Ferrell’s films. 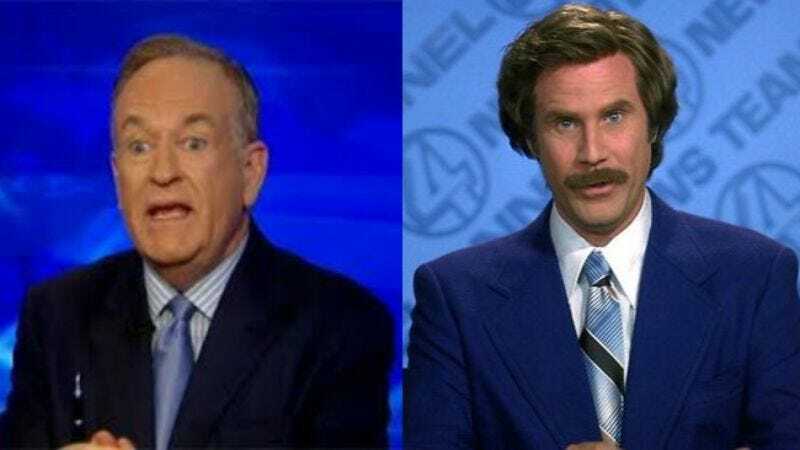 O’Reilly reined in some of his outrage once he was back on his own show, going so far as to acknowledge that Ferrell has made some good movies. But he said his offer is still on the table, in case Ferrell wants a “gentle” lesson on the evils of socialism.